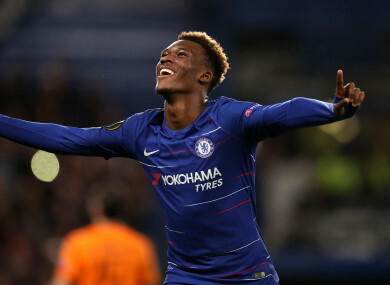 Hudson-Odoi celebrates scoring for Chelsea in the Europa League. MAURIZIO SARRI HAS lashed out at Bayern Munich for their ‘unprofessional’ behaviour after the Bundesliga club publicly expressed their interest in Chelsea starlet Callum Hudson-Odoi. Chelsea have reportedly turned down a £35 million bid from Bayern for the 18-year-old, who has less than 18 months to run on his current contract and has so far refused to sign a new five-year deal, and Sarri is unhappy with Bayern’s public approach. “I think that it’s not professional, because they are talking about a player under contract with Chelsea,” Sarri told reporters on Friday. They didn’t respect our club, I think. But, having helped England win the U17 World Cup, Hudson-Odoi could follow the same path taken by his international teammate Jadon Sancho, who has impressed for Borussia Dortmund since leaving Manchester City for Germany. “As you know very well I am not involved in the market. I spoke with the club and the club knows very well my opinion. In my opinion we need two players,” he said. “Of course, if Morata will go to another club we need a replacement, it’s normal,” Sarri said. “Willian for us is really very important. I think it’s impossible to lose him in January,” he said. Email “Sarri blasts 'unprofessional' Bayern over Hudson-Odoi interest”. Feedback on “Sarri blasts 'unprofessional' Bayern over Hudson-Odoi interest”.